I'm a proud owner of a 99' copy of the game. And I played in the past lot and lot of hours and i have finished the game in godlike mode in the past. Now I have reinstalled the goty edition after more than 10 years. Of course i have lost lot of skill since that time but i'm finding bots more smart than the past. Has the goty version received tweaks on IA skill? I don't remember this difficulty in godlike. I remember it was really hard but not like this. I'm stuck at the Turbine. Most of the times seems like their bullets do more damage than me. And really often there are no weapons in the map cause bots pick them all up. And for long moments I can only play with enforcer. For the bots AI there is some community stuff to make them even smarter, but I am pretty sure others will jump right in and tell you all about it in a moment. As for the weapons, there's a setting you need to turn on for the weapons to stay after they're picked up when you start a practice session: in the tab Rules there's a Weapons Stay checkbox, so you just need to check it, and you're good to go. Tamerlane wrote: I remember it was really hard but not like this. I'm stuck at the Turbine. Tamerlane is playing the ladder. 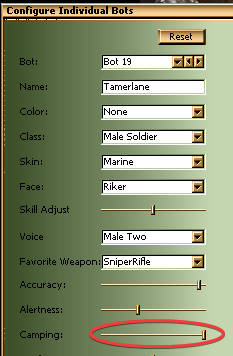 Feralidragon wrote: in the tab Rules there's a Weapons Stay checkbox, so you just need to check it, and you're good to go. No one can tell me if the GOTY edition received tweaks on IA skills? Anyway I'll try and try again to win the tournament again! Welcome and enjoy UT again! Lots of reigniting players find out how difficult this game actually was, when they jump back in after 5/10/15 or even 20 years! For the SP ladder it's default, and comes as it is. AFAIK, there are no custom AI for the default ladder. For servers, there are more options. You can maybe tweak them manually in your User.ini to see if you can get them more friendly. Values go from 0.000000 to 1.000000. You can set this from 1 to 8. Where 1 is 'Novice' and 8 'Godlike'. Tamerlane wrote: No one can tell me if the GOTY edition received tweaks on IA skills? As far as I know, In the single-player ladder (the Tournament) are bots a little bit different. Some maps are tailored for these specific bots. Xan's map Hyper Blast for example is one of those maps. No Bot in the practice match will react like him. Xan is also the only bot who is not available in the practice matches by default. hey, what are you doing? Weren't you supposed to be camping??? I believe the main difference between the regualr UT ladder and the GOTY one was some of the bonus pack maps got included in, as well as the Skaarj Hybrid team added. Now I forgot wether any show up on Turbine, but yeah they can be pretty tough. I am so happy to see all of you guys that loved this game and still do. I've always loved this game. Well of course Tamerlane is one of the best bot of the game, if not the best. I chose this nick cause i like that bot! I can't imagine how i finished the game in godlike in the past where now i am so noob at it. Anyway thanks guys for the answers to my question. EDIT: I finally won Turbine in godlike after 3 days of attempts. I'm literaly exaust. How I did it? I have not used power ups, just constantly going to pick quickly the rocket launcher and spam rockets aggressively. Maybe it is the key to gain some more kills. Ready to suffer more with next level. That guide is really useful thank you.